Sweet, powerful and aromatic, cloves are one of the most expensive and sought after spices in history. It was once a treasured commodity prized by the Ancient Romans. In 3rd century BC, a Chinese ruler of the Han Dynasty demanded that those who addressed him must chew on cloves to freshen their breath. In fact, this spice was one of the first to be traded as far back as 1721. Cloves were one of the most precious spices of the 16th and 17th century, and control of them spurred expeditions as well as wars. Cloves are still widely used in Asian, African, and Middle Eastern cuisines, lending flavour to meat, curries, and marinades. The clove is the dried flower bud of the evergreen clove tree. Originally native to the Maluku Islands, cloves are commercially harvested in Indonesia, India, Madagascar, Pakistan, Zanzibar, Sri Lanka, and Tanzania. It likes the tropics and grows best near the sea. Rainfall must be more than sixty inches per year and a parched season is needed while harvesting and curing. Clove trees can grow up to 12m in height with its flowers grouped in clusters. The flower buds initially take on a pale hue before turning green and then transitions to a bright red, indicating the buds are ready for harvest. These clove clusters are then pulled out by hand before the buds open and are dried on palm mats to give us the aromatic spice. Cloves can easily overpower a dish, especially when ground, so use only a few cloves at a time. You should keep them in a tightly sealed glass container in a cool, dark and dry place. 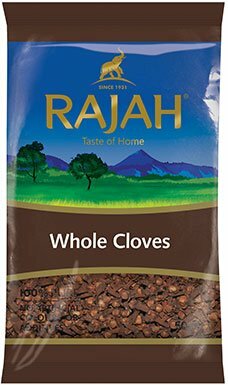 Ground cloves will keep for about six months, while whole cloves will stay fresh for about one year if stored properly. You can also extend their shelf life by storing them in the refrigerator. The clove is said to contain an essential oil with many medicinal properties and has been used for centuries in Indian Ayurveda and Chinese medicine. Cloves have long been used to aid in dentistry as they have local anesthetic properties. You may even have childhood memories of being asked to keep a clove under your tongue to soothe a toothache. Although they are underappreciated for their medicinal uses today, cloves have been used since ancient times to treat many ailments. They have antiseptic, antibacterial, antifungal, antispasmodic, antiviral, analgesic, and simulative properties making them a great overall healer. They can be used to stimulate the mind as well as prevent nausea, diarrhea, ease coughs, aid in digestion, and even treat conditions like malaria and cholera.